Eastern Red Cedar (Juniperus virginiana). 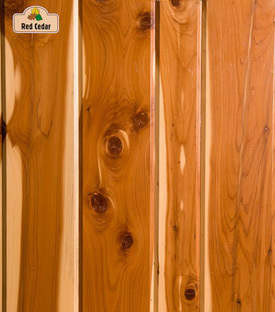 Also known as juniper, red juniper, eastern juniper, redcedar, savin, and pencil cedar. Grows in eastern half of North America. Appearance: Straight and even grained with a fine uniform texture. Creamy white sapwood and light reddish or purplish heartwood that ages to a darker red or reddish brown. Often contains numerous knots. Physical Props: Moderately heavy, hard, and strong with low stiffness, very high decay resistance and good stability in service. Working Props: Works easily with hand or machine tools and is ideal for carving or whittling. Small, hard knots can sometimes be troublesome when planing. Glues satisfactorily. Takes a beautiful natural finish. Uses: Used previously for pencils but primary use today is fenceposts. Other uses include chests, closet lining, novelties, buckets, shingles, boat building, and other exterior applications.